The next-generation Maruti Swift is designed from scratch and flaunts more contemporary looks than the current Swift. Update: The 2018 Maruti Swift has been launched at Rs 4.99 lakh at the Indian Auto Expo. 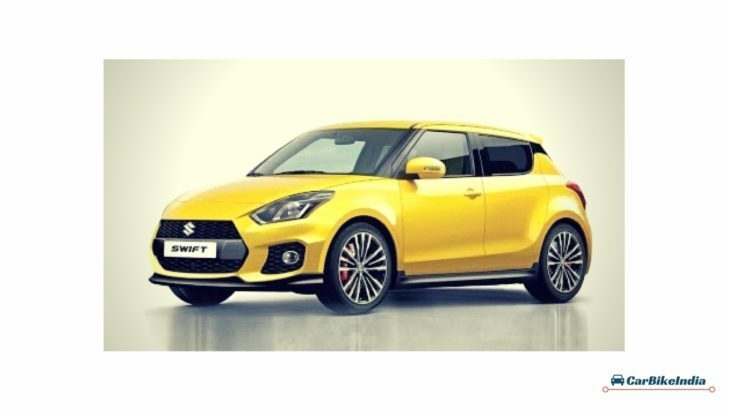 India’s largest passenger carmaker Maruti Suzuki is all set to launch the all-new 2018 Maruti Swift at the upcoming 2018 Indian Auto Expo in February next year. While retaining the essence of the Swift nameplate, the popular hatch gets an extensive list of changes both inside and out. Like its cousin, the 2017 Maruti Dzire, the new Swift looks to unsettle its rivals with its appealing style and feature-rich interiors. It rivals with the recently refreshed, the Hyundai Grand i10 and the Ford Figo. The third-generation Swift shares the same, light-weight, HEARTECH platform with the Dzire and is likely to share most of its feature list as well. It is likely to get redesigned front bumper, auto LED headlamps with LED daytime running lights, 15-inch diamond-cut alloys and tail lamps with LED graphics. An important update would be the company’s 7.0-inch SLDA infotainment system with Apple CarPlay, Android Auto and Mirror Link connectivity. As the carmaker is looking to standardize dual airbags and ABS with EBD in all its cars, we expect the new Swift to get the same as well. For your information, the new Dzire already gets them as standard. On the inside, the new Swift is expected to get an all-black treatment. Contrarily, the new Dzire features a dual tone one. Unlike previous generations, the Dzire and the Swift can be easily distinguished courtesy different bumpers and interior colour theme. Working on the strategy, if isn’t broken why fix it, the Japanese carmaker will plonk the same set of engines like its current version. The new platform has slashed its weight by a good 50 kg. This would certainly boost Swift mileage figures along with its fun-to-drive character. Have a look at the present Maruti Swift specs, which is likely to remain same in the newer version as well. The biggest addition apart from the design changes will be the availability of exciting new colour options in the new Swift 2018. The new Maruti Swift 2018 will be available in 8 different shades – Black, Blue, Brown, Grey, Red, Red Metallic, Sky Blue, White and Champion Yellow. Furthermore, a sportier version of the Maruti hatch, Maruti Suzuki Swift Sport might also make its way in the country at a later stage as the carmaker is also focussing on cars for performance freaks – the Maruti Baleno RS is an example of it. With the addition of new features and a new platform, the Maruti Swift 2018 price is likely to cost a premium over the current model’s prices. We expect it to fall in the price bracket of Rs 4.90 lakh – Rs 8.00 lakh (approx. ex-showroom).